TiCell P is a SCMS Technical Grade specifically developed as an additive for water based dispersion paints. It is an excellent thickener with good adhesion ability; it helps film formation and increases viscosity. It also improves the hiding power of paints and reduces paint run. High active content (~99%) CMC grade is recommended for dispersion decorative plaster and for pasty production as well. The 'TiCell R'-types can fulfill the higher quality requirements of water absorption and even water resistance. Three viscosity levels are available. These products are not chemically treated; they are environmental friendly and natural products. very low viscosity CMC for paints and plasters. Silicate stable and good open time. Medium viscosity CMC for paints and plasters. Silicate stable. Granulated form: used to create a completely homogeneous solution. 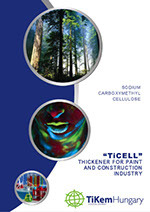 The TiCell R product range is purified CMC with 97-98% active content. Can be used as a thickener and rheological agent for dispersion plasters. High viscosity CMC for paints and plasters. Silicate stable. Little CMC necessary for high viscosity. A wood fibre which can be used for plasters, paints and mineral products. For more information please contact our Sales Department.